Russia has positioned itself as the main supporter of Nicholas Maduro regime in Venezuela, taking the risk of turning a crisis in a far-away country into an embarrassing political defeat. Official propaganda has amplified this issue, so that 57 percent of respondents in a recent poll confirmed that they were following the developments, but only 20 percent of those who were interested believed that the US “provocation” was behind the crisis (VTsIOM, February 8). While Russia’s firm stance could turn out to be a mistake, it is determined by more than just “friendly feelings” toward Venezuela, so the appeal of US National Security Adviser John Bolton to Russia to change its course would hardly be heard. A third of readers of the business-oriented daily Kommersant tend to believe that frustrating the US policy is the main motivation of Russia’s course, but in fact, there are at least four underlying drivers in it. Firstly, Russian foreign policy pursues a committed ideological line against revolutions. There is certainly nothing personal in President Vladimir Putin’s embrace of Maduro, much the same way as he has no sympathy to North Korean dictator Kim Jong-un, with who he is planning to meet in Russia later this spring (Nezavisimaya gazeta, February 7). What is a matter of principle for Putin is his self-serving proposition that authoritarian rulers, whether such ridiculously vain as in Turkmenistan or left-leaning as in Venezuela, cannot be removed from power by street protests. The obvious challenge to this stance comes from Armenia, where a corrupt government was defeated by a popular uprising last spring, when Putin was busy orchestrating his re-election for the new presidential term. Armenia remains Russia’s key ally in the Caucasus, but Putin harbors deep resentment to the new leadership of street-smart Nikol Pashinyan. Secondly, Russia has invested some $US 17 billion in the Venezuelan oil sector and delivered on several arms export contracts, including Mi-37 helicopters and Su-30MK2 fighters. Russian state oil company Rosneft has provided some $US 6.5 billion credit to Venezuelan PDVSA and continues to take oil as payback despite the US sanctions against this Maduro-controlled company. This money and the risky supplies of oil products are not that significant for Rosneft, but for Igor Sechin, who rules this business as a personal enterprise, Venezuela has become a personal priority. It is unclear whether Sechin, who call pull many strings in the Kremlin, is involved in the shadowy deals on transporting gold out of Venezuela. What is clear, however, is that a major threat to Russia’s oil interests looms with the possibility of opening the oil business in Venezuela for Western investments, which could bring plentiful new supplies and deliver the price to a lower plateau than the present one, barely sufficient to fill Russia’s budget. China wants to see an increase in the oil output in Venezuela and is ready to cooperate with Western investors, and Russia would much prefer a protracted crisis and contractions in the oil export. 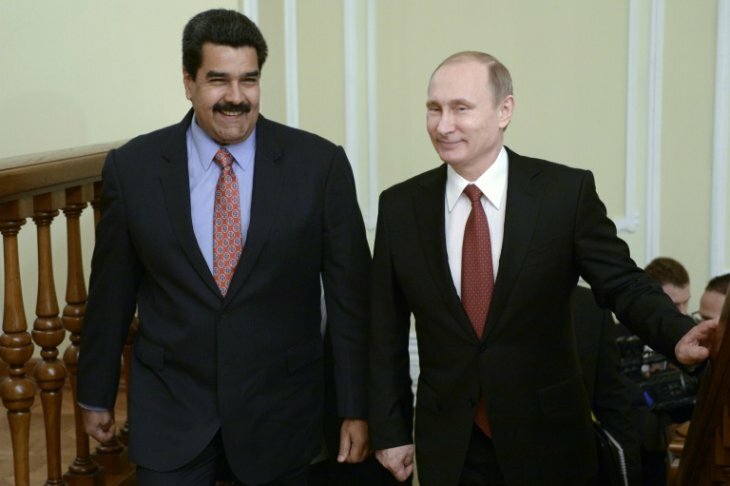 Thirdly, Venezuela has become a destination for showing the long reach of Russia’s power projection. The Navy is presently not able to sail that far, but the visit of two Tu-160 strategic bombers last December was supposed to have symbolic significance – nor that it has helped Maduro much. Several inexplicable unscheduled flights gave ground for suspicions in arrival to Caracas of Russian mercenaries from the so-called “Wagner group”, which has become for the Kremlin an instrument of choice for clandestine military missions (The Bell, January 31). Official denials are far from convincing, particularly because Russian Defense Ministry has never acknowledged the crushing defeat of the “Wagner group” by the US forces near Deir ez-Zor in Syria in February 2018. The support of the army is crucial for the survival of Maduro’s regime, and the appearance of a few hundred trigger-happy Russian mercenaries could become a catalyst of erosion of this far from rock-solid support. Russia has no capacity for a military intervention across the Atlantic, and its attempts at sabotaging the US sanctions against the Maduro regime are far from effective. Finally, Russia seeks to be not only on the same page but even a step ahead of China, which has far greater stakes in Venezuela than Rosneft. Beijing, however, has opted for a more cautious course in securing its investments expressing support for Maduro but abstaining from any interference or criticism of the US pressure. The Chinese leadership is indifferent to the quasi-socialist discourse introduced by Maduro’s predecessor charismatic Hugo Chavez but very attentive to the economic disaster in the country perhaps concluding that a new government is necessary to sort it out. The Kremlin is disappointed in this Chinese ambivalence, but Beijing has more reasons to be disconcerted with the Russian readiness to escalate the conflict. Fundamentally, China wants to see an increase in the oil output in Venezuela and is ready to cooperate with Western investors, and Russia would much prefer a protracted crisis and contractions in the oil export. Russia is preparing its own draft resolution on Venezuela for the UN Security Council meeting, but the intention clearly is just to block any recognition of legitimacy of the opposition to Maduro’s rule. Moscow also rejects the EU efforts at establishing a Contact Group with the Latin American states concerned about the chaos in Venezuela. This stance resembles the readiness to back Syrian dictator Bashar al-Assad who was entirely ostracized in spring-summer 2015 but is now increasingly accepted as the only real authority. Unlike the Syrian case, however, Russia has no capacity for a military intervention across the Atlantic, and its attempts at sabotaging the US sanctions against the Maduro regime are far from effective. Putin’s stubborn stance might appear misguided, but it follows the conviction that the crisis inevitably leads to unleashing severe repressions against the protesters, at which moment every external “mediator” would back off and issue useless lamentations. Putin also believes that he understands Trump’s motivations and disinclinations better than most “experts”, and so rules out any US military intervention. His calculus quite probably will be proven wrong, and then the question will be who is going to pay for the one setback too many in Russia’s passive-aggressive foreign policy. A version of this article was published in Eurasia Daily Monitor.